It’s the Wedding Season and clients love our custom Calligraphy Wedding Menu Cards here at Hyegraph Invitations & Calligraphy! Jacques and the Hyegraph Invitations & Calligraphy staff design Custom Menus with Digital/Computer Calligraphy Printing to suit the theme of the wedding, party or event. We can custom cut and layer the Menu Cards with colored stock stationery and print with our Digital/Computer Calligraphy in a range of ink colors and font styles to complement your wedding, party or event colors and theme. The above Wedding Menu Cards printed with Computer/Digital Calligraphy are all custom made for our clients’ upcoming weddings, parties or events. 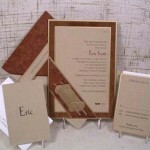 The examples above are two layers of stock printed by Hyegraph Invitations & Calligraphy. The red, white and blue menu cards were created for an Olympic event showcasing the American Red, White and Blue color scheme for the American Flag. These Menus are printed with our Elegant Calligraphy in black ink on matte white stock stationery with mercury blue stock stationery and red geisha stock stationery to complement the Olympic Theme. The above tarragon bordered menu card is an example of a Menu Card printed with our machine calligraphy/digital calligraphy in black ink with flat calligraphy printing on ecru linen stock stationery with Menu choices. The green bordered menu card is (coriander green ink) printed with our Machine/Computer Calligraphy on ecru mica stock stationery printed with matching ink Calligraphy by Hyegraph Invitations & Calligraphy. 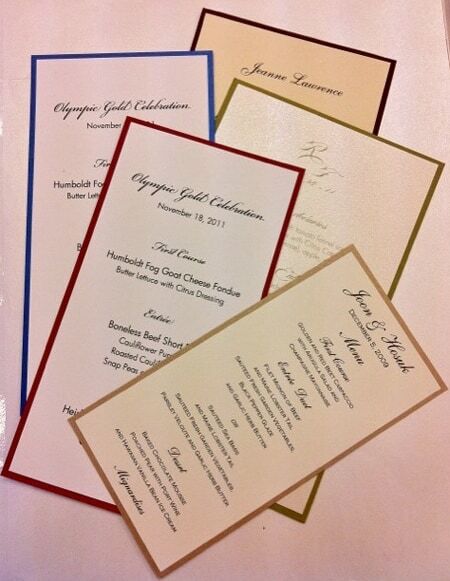 Total price for each printed Menu card including two layers of stock and Printed Calligraphy is $3.00. Please inquire for your choice of Menu Cards. 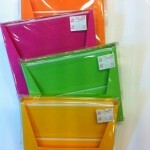 We will give you a quote depending on stock choice and layers. Please email us at: info@hyegraph.com or call us at 415-626-0461 or stop by at Hyegraph Embarcadero in San Francisco. For place cards with printed calligraphy, table name and table numbers with printed calligraphy and envelope addressing with Digital/Computer Calligraphy see our Calligraphy Page. For our beautiful selection of Wedding Invitations and Party Invitations please see our Wedding Invitations page and Menus on our Blog. To order online please go to our Shop Online page.